The first thing I notice when I look at the witness blanket is the large door that is in the middle of the display. Doors are used as supports when you are building a house; they assist in holding up the roofs and beams. The door in the display has the same effect, it holds the display together; not only does it connect the two sides but it sets the whole frame. If there is a door, than it must have opened to a room; was this a door to a bedroom, a bathroom, a main door, a classroom? 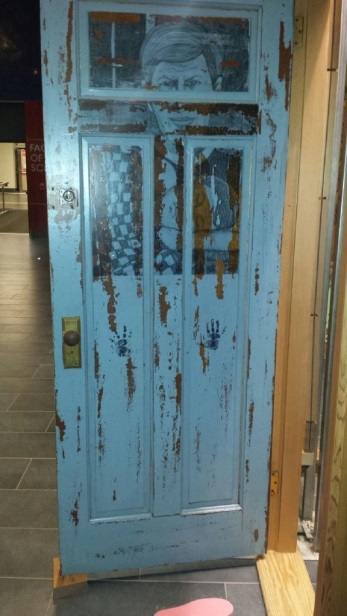 In the image, the website provides the door being closed, on the side that is shown there is a painting that shows what appears to be a dark forest but it is not this that makes the door so interesting. It is the other side that adds mystery, the painting on the other side has two parts, the first is a young child sleeping; that leads to the conclusion it was a bedroom. The second part of the painting is what makes the artifact uncomfortable, above the sleeping child there is a male figure watching. A bedroom is supposed to be a place where you can be yourself, be safe and protected. Behind a closed door, a child should feel comfortable. It is hard to believe that the children that slept behind this door felt safe or protected. The thought that even when they were sleeping in a state of vulnerability, someone was watching them is a terrifying thought. This door could have been the separation between others and the abused. This door could have been witness to abuse, neglect, tears, prayers and other untold tragedies that were experienced by innocent aboriginal children. A bedroom door is meant to close a person off from the real world so they can escape from their personal problems, it is not meant to hold a child in so that their personal problems can find them when it is convenient. The second artifact that caught my attention was the drum. The point of residential schools was to kill the Indian inside the man, to remove their heritage, language and beliefs. The drum was and still is a large part of aboriginal heritage; it is shocking that such a valuable piece of aboriginal heritage was found within residential schools. Traditional languages, practices and beliefs were beaten out of innocent children, yet a drum was left for the aboriginals. It does not make sense; was this drum there as a reminder of how their heritage was bad, was it snuck in by a young child and hidden away as a remind of who they are? On the other hand, did those running the school not realise the value of the drum to aboriginal heritage, did they not care, or was it not an artifact of a residential school, but something that was added as a connection piece between the victims and the survivors? It is easier to think of the drum being added as a connection piece because the thought that such an important piece of aboriginal traditions was considered unimportant is more frustrating than the thought that they allowed a drum into the school as a reminder of the heritage that they were being removed from by force. The fact that the drum is present in the witness blanket adds more meaning to the situation than the other pieces, because it connects to their heritage. The witness blanket as a whole has lots of meaning; it provides evidence of the struggles that the survivors went through and the slow healing process that they are still going through. The door shows that past, it was witness to events that took place behind the door. The drum provides the opposite effects by having the connection to both traditional beliefs and future generations. 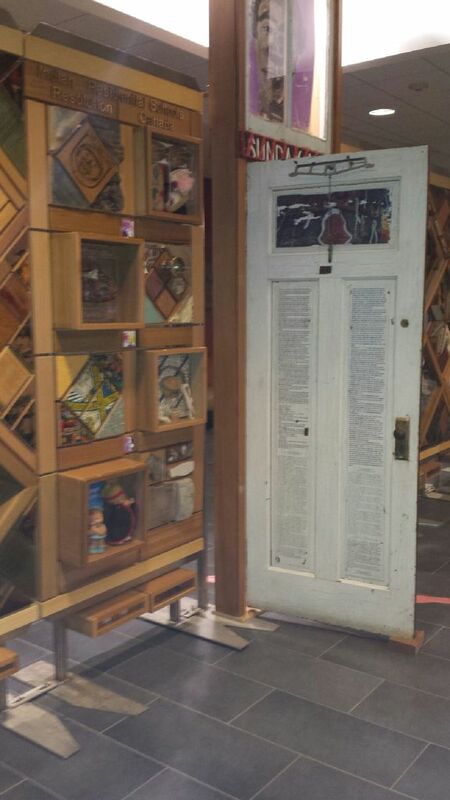 Two things that have little to do with each other, except that they are in the same display, yet they both important to the whole picture, the door is the support and the drum connects the past to the present. Citizenship education is hard for me to wrap my head around. I do not remember being taught it in school, I do not remember any mention of what it takes to be a citizen. I briefly recall something about making a list what it means to be Canadian. The list included stuff about being friendly, polite, saying eh, knowing how to skate, and liking maple syrup. This list sounds like something made by those in middle school but in fact we were in grade 11 or 12, and the discussion had nothing to do with social studies, or citizenship education, it had to deal with a poem read in an English class. Not once was there any discussion about what it means to be Canadian, how to become a Canadian, our rights as Canadians, or how current events were impacting citizenship. The last election was in 2011, you would think that this would lead to some discussion about politics, but the only mention of politics was that the teachers in my school made a collective decision that they would not discuss it with students because they did not want to influence our opinions. That is all that was said. We learned nothing about the parties, about those running, we did not even talk about how the provincial government was designed, anything about politics were not discussed in any grades, in any forms. Bill C-51 was big in the papers this spring, my little brother was in grade 10. Besides what he seen on TV and the internet he knew nothing of this bill. When it was brought up in school the teacher he had referred to the agreement that was made back in 2011. The teachers would not talk about politics, this meant more than I realized by in grade 12. Everything can be political depending on your point of view, as I inquired a little more about what the teachers considered by political discussion I found out this meant anything that was being discussed in the house of commons unless directly related to an outcome. I think this is because schools are so worried about offending someone than they often forget about what the students need. Teachers do not answer to their students, they answer to the parents, principals, STF, government and school boards. In a small town it is easy to offend parents when you teach anything that differs from the small town perspective, and parents can make a teachers life a nightmare in a small town. Teaching about democracy without using elections seems silly, but it seems just a silly as having half a town mad at a teacher because they brought up the wrong discussion in class. Schools have an opportunity to use current events, but maybe there are situations when those current events will cause more problems than anything else. Teachers know their school, students and community, while some schools are open to teaching citizenship and democracy using real situations, others are aware it will do more damage than good.